Jonas & Susannah Snider & family. Jonas Snider: Mennonite bishop and farmer; born 2 October 1858 in Waterloo Township, Waterloo County, Ontario, Canada, youngest of 12 children, to Elias Snider (1815-1890) and Hannah (Bingeman) Snider (1815-1893). Jonas Snider and Lucy Ann Snyder (26 May 1857-11 June 1886) married in 1879. Born to them were four sons. Jonas Snider and Susannah Horst (2 June 1862-1 July 1933) married in 1887. Born to them were two daughters who survived into adulthood, and four sons. Jonas died 6 September 1944 in Waterloo, Ontario. Jonas Snider lived his entire life on the farm where he was born, several kilometers north of Waterloo, Ontario. He received a public school education. His father, Elias Snider, was a prominent mill owner and Mennonite minister (ordained 1874) who served the geographical "neighborhood" around the David Eby meetinghouse, several kilometers west of Waterloo. Activities such as Sunday school and protracted evening meetings (social meetings) gained in popularity and evolved within the Mennonite Conference of Ontario in the late nineteenth century. When these contentious activities contributed to a conference schism in 1889, Elias Snider sided with the traditionalist Old Order movement, and his son Jonas and daughter-in-law Lucy, much involved in the newer practices, held with the Ontario Mennonite (Mennonite Church) Conference. Chosen by lot, Jonas Snider was ordained as minister at the David Eby meetinghouse on 24 June 1892 to serve the geographical field vacated by his father. The schism of 1889 had also led to a shortage of Conference bishops in Waterloo County, and so at Cressman meetinghouse (later Breslau Mennonite Church) on 17 November 1895, bishop Elias Weber ordained Jonas Snider as bishop. 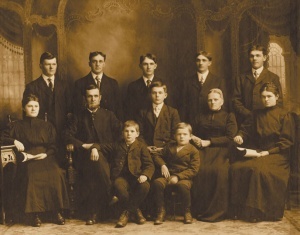 Snider's responsibilities as bishop for Waterloo Township meant his pastoral duties at his home appointment of David Eby's (later Waterloo, then Erb Street Mennonite Church) received less of his attention, and so in 1900 Noah Hunsberger was ordained minister to address the shortfall. Snider traveled widely, preaching at many outlying appointments. He officiated at well over 200 weddings. Jonas Snider was considered a capable speaker. He preached in the German language early in his career, and although in the early twentieth century he and his colleagues began preaching more and more in English, Snider continued to be called on to preach in German at special services such as funerals and building dedications. In 1924, bishop Snider silenced Urias K. Weber, pastor at First Mennonite Church, Kitchener, after the Ontario Conference had ordered communion privileges to be withheld from (excommunicated) a group of members at First Mennonite until they complied with a conference resolution prescribing uniformity in the wearing of bonnets by Mennonite women in public. However, when the group withdrew from conference membership and reorganized as the Stirling Avenue congregation, it seems Snider conferred his "unofficial" support to Weber with the words, "I am an old man and cannot go it alone so will stay with the church … Stay with your group. Stay together and God bless you." Indeed, many who lived during Jonas Snider's tenure as bishop remembered him for his more conciliatory personal nature than what was sometimes required of him by his office. Snider sanctioned the work of the women of his home congregation, Waterloo Mennonite Church, when in 1908 they proposed to organize an all-female church committee for the purpose of turning out sewn articles and other handwork for local and overseas relief. While common in other Christian denominations by that time, such a "sewing circle" committee was unprecedented in Ontario Mennonite communities. Our hosts are very friendly and helpful…if we say we need anything immediately it is brought to us…The husband of the family for whom my Peter works, is a bishop. We refer to them as Grandpa and Grandma Snider. They have offered to give us a pig for butchering, later this fall. On 18 June 1930, Jonas Snider officiated at what was likely the first wedding to take place inside the building at Waterloo Mennonite Church when his son, Gilbert Snider, and Louida Martin were married. Jonas Snider had retired from most of his bishop's responsibilities by 1936, but served his post officially until 1942. Snider was a minister and bishop during a period of significant doctrinal changes in the Mennonite church in Ontario. Church and family members remembered him as a humble and forbearing, if cautious, church leader, who in the exercise of his duties sought to interpret the Gospel in good faith and mediate compassionately between the conference and the congregations in his care. Eby, Ezra. A Biographical History of Waterloo Township: A History of the Early Settlers and Their Descendants. Berlin [Kitchener], Ontario: Ezra Eby, 1895. Harder, Laureen. Risk and Endurance: a History of Stirling Avenue Mennonite Church. Kitchener, Ontario: Sirling Avenue Mennonite Church, 2003. Kessler, Karl. Path of a People: Erb Street Mennonite Church 1851-2001. Waterloo, Ontario: Erb Street Mennonite Church, 2001. "Snider." Gospel Herald 37 (22 September 1944): 503-504. "Snyder." [sic] (Lucy Ann Snider obituary) Gospel Herald 23 (1 July 1886): 205. "Snider, Susannah (Horst)." Gospel Herald 26 (27 July 1933): 367-368. Personal Papers at the Mennonite Archives of Ontario. Kessler, Karl. "Snider, Jonas (1858-1944)." Global Anabaptist Mennonite Encyclopedia Online. 2006. Web. 22 Apr 2019. http://gameo.org/index.php?title=Snider,_Jonas_(1858-1944)&oldid=143329. Kessler, Karl. (2006). Snider, Jonas (1858-1944). Global Anabaptist Mennonite Encyclopedia Online. Retrieved 22 April 2019, from http://gameo.org/index.php?title=Snider,_Jonas_(1858-1944)&oldid=143329.